Three Maydays were reportedly transmitted during the incident. One other firefighter, reported as a Charlotte Fire Department member, has been hospitalized. The initial departments on the alarm were Pineville and Carolina, dispatched at 21:03 hours. Charlotte Fire was requested to send mutual aid, first with a box (three engines, a ladder and Battalion Chief). The incident was upgraded to a three-alarm response. See all Mecklenburg County fire station locations at FDmaps.com. West Meck and Pleasant Valley, SC (Lancaster) were providing coverage. Based upon real estate research, the fire building appears to date to 1976. Construction is described as concrete block on a slab foundation totaling 70,078. The center appears to have received a renovation in recent years, and called the “Countryside Shopping Center”. It is unknown if a sprinkler system was installed at the time of the renovation. Learn more about the Pineville Fire Deapartment. Fire scene on Sunday morning. ATF, Mecklenburg County and Charlotte Fire Investigators on scene. Image courtesy @DiannaRuggonTV. Lowered flag at Pineville Fire Department. Image courtesy @RobinFox46. 21:03 – Pineville Police respond for intrusion alarm, find smoke in the building. 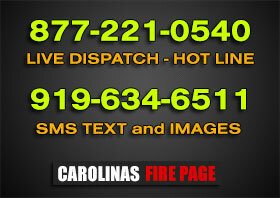 21:06 – Pineville and Carolinas fire departments dispatched for a commercial structure fire. 21:10 – Fire units arrive on scene. 21:43 – Downed firefighters removed from the building. 21:45 – Firefighter Sheltra transported to CMC Main. 22:00 – MEDIC arrives at hospital. 22:22 – Firefighter Sheltra pronounced. Fire determined to be result of a lightning strike. Arrangements are pending and will be posted on a new article when available.